Like the ring nebula, I haven’t imaged this one since the summer of 2015. Big improvement since then. Also like the ring nebula, I wanted to catch the outer shell of this Planetary nebula. One difference is that here I used my new Astro-Physics CCDT67 reducer, which lowered my resolution a bit but greatly improves the light gathering capabilities of this scope. The Dumbbell nebula was discovered by Charles Messier and was the first planetary nebula to be seen by humans. It’s name was coined by William Herschel who noted that the nebulae had a circular shape similar to a planet. In reality, this is a star shedding its outer layers in a very colorful death. 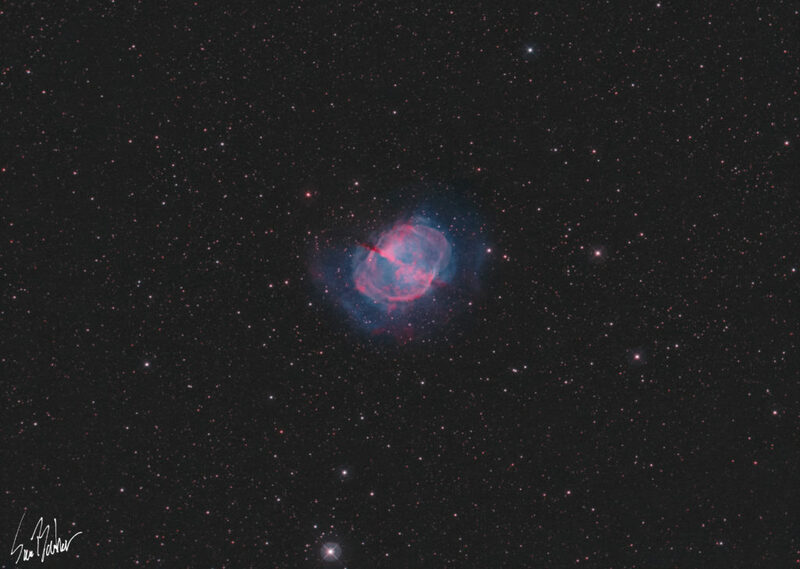 I imaged M 27 in Ha and OIII (Hydrogen as red and oxygen as blue) to bring out the faint details of this intricate nebula.